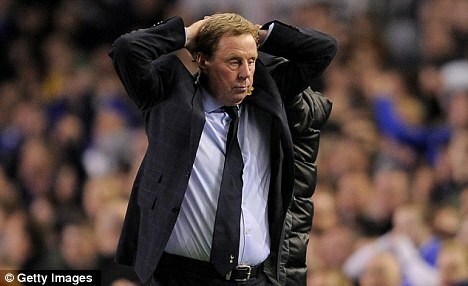 Harry Redknapp's primary worry shouldn't be the three successive defeats. Spurs have a relatively more straightforward close to the season than Arsenal. However, a less onerous set of closing fixtures means little if your best players aren't performing at expected levels. You only have to take a look over the Seven Sisters Road at Arsenal's fortunes over the past two seasons, to see how seven months of good work can crumble in the season's closing stages. There's no doubt that the fatigue of the arduous English campaign has been a factor. Redknapp has one of the Premier League's strongest squads, but he has relied heavily on a specific crop of players. Injury problems are a constant blight to captain Ledley King, Rafa Van De Vaart and Aaron Lennon. Luka Modric is a class act but has not been helped by having to cover absences in the wide positions. Gareth Bale has been arguably Tottenham's best performer, but is too often relied upon for inspiration, and his propensity to go to ground is garnering him a reputation as a cheat. Emmanuel Adebayor has led the line well, but has struggled when the team have needed him most - something that Arsenal fans are all too familiar with. And Younes Kaboul (possibly the league's most improved defender) has dropped a series of rickets in recent matches - his error for Everton's winning goal a case in point. Add that to Kyle Walker's inexperience at right-back, giving the Tottenham back line an increasingly fragile look. Spurs must arrest the slide against Stoke a week on Wednesday, or Redknapp's ambition for the club to end the season as London's premier side will dissipate fast. - Things aren't only getting tense in North London, but in Manchester. What's at stake isn't 3rd place and Champions League qualification, but the more coveted prize of the Premier League title. Manchester United have managed to keep pace with their arriviste rivals, and after victory at home to West Brom, are now top of the table as Manchester City fell to a 1-0 defeat to Swansea. Now, City have led the way for most of the season, and have been tipped by many to win their first league trophy for 44 years. But while they have been flawless at home, City have dropped too many points away from the Etihad Stadium. After his outfit's 1-1 draw with Wigan on Sunday, Norwich manager Paul Lambert said that while he wanted his team to win the match, it was important that they didn't lose it. This is something that City have failed to do often enough on their travels. Their four league defeats against Chelsea, Sunderland, Everton & Swansea are games that the Citizens should have been able to take at least a point from. These accumulate over a season as those extra four points would kept the blue half of Manchester at the Premier League's summit. This is something that Manchester United have never needed to be made aware of. And if City don't learn this lesson fast, they'll be forced to look on enviously at United lifting yet another Premier League trophy. - While media talk is focusing on the battle for supremacy in North London and Manchester, that shouldn't take one's eye away from a similar battle occurring in Merseyside. Since winning the Carling Cup, Liverpool have lost their last two games. If they were to lose their third in a row against Everton tomorrow night, then the Toffees will rise above their bete noire from across Stanley Park in the league table. With Sunderland also looking resurgent under the stewardship of Martin O'Neill, Liverpool have to be watchful that they don't end up finishing as low as 9th. - After being demoted to Serie B in disgrace after the calciopoli scandal, Juventus have put themselves in with a good chance of winning their first (legal) Serie A title since 2003. Ex-fan favourite, Antonio Conte has done a fine job in making Juventus a domestic powerhouse again. But like some of the team's mentioned earlier in this post, Juve seem to have hit a wall in the past few weeks, drawing five out of their last seven matches. Their lead at the top of the table has been overhauled by reigning Italian champions, AC Milan. What is curious about all this however, is that the Old Lady is yet to lose a league game so far this campaign. Could Juventus end up with the bittersweet accomplishment of going the entire Serie A season unbeaten, and yet still failing to win the title?